If you choose Amorgos for your summer holidays we would highly recommend a visit to the beautiful island of Santorini. The two islands are located in close distance and the Amorgos - Santorini ferry route is operated usually once a day, throughout the whole summer season. The ferry trip from Amorgos to Santorini is mostly served by high speed ferries and the trip duration is about 1 hour and 10 minutes. The cost of the Amorgos - Santorini ferry ticket can change every year and it depends on the ferry company and the vessel type. According to 2019 data, an approximate price for the ferry trip from Amorgos to Santorini is around 50€ (economy seat) for the high speed and approximately 13€ (economy seat) for the conventional vessel. On Ferryhopper you can find all the available itineraries from Amorgos to Santorini and book your ferry tickets fast and easy! How long is the ferry trip from Amorgos to Santorini? Amorgos is located approximately 76 km (47 miles) from Santorini which means that if you take a high speed ferry the trip can last a bit more than 1 hour. Usually one day in the week there is also the option to get a conventional ferry, the renowned ‘Express Skopelitis’, which takes a bit longer but it’s worth the experience. The ferry trip duration from Amorgos to Santorini with ‘Express Skopelitis’ is around 4,5 to 5 hours. Before you book your holidays to Amorgos you should be aware that the island has two ports, one in the south of the island (Katapola) and one in the north (Aegiali). The ferries that connect Amorgos to Santorini usually depart from the port of Katapola. How often ferries depart from Amorgos to Santorini? Amorgos is regularly connected to Santorini with both direct and indirect ferry connections. Summer months - direct connections: The Amorgos - Santorini ferry route is served by direct ferry connections only during the summer, usually once a day. One day every week there is also the option to get ‘Express Skopelitis’ from Amorgos to Santorini, a legendary conventional ferry that is cheaper but it takes a bit longer to reach your destination. 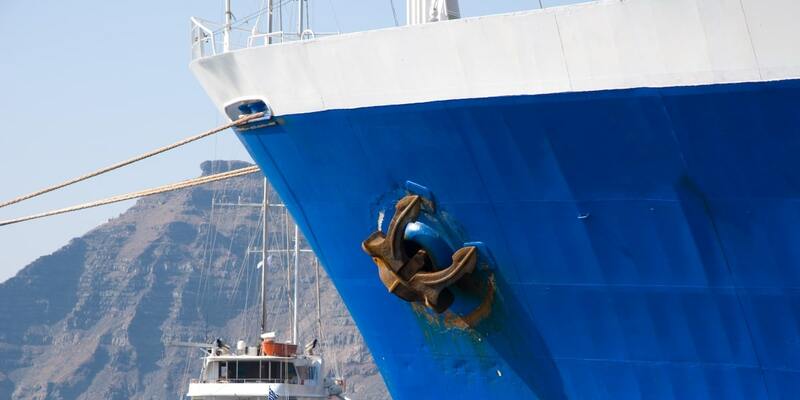 Summer months - indirect connections: During the summer many ferries depart from the ports of Amorgos (Katapola or Aegiali) to other islands of the Cyclades, like Naxos, Mykonos or Paros which also serve ferry connections to Santorini. So if you fancy some island hopping in the Cyclades you can choose to travel from Amorgos to Santorini via another island and get the most of your holidays in the Aegean sea. Winter months - indirect connections: From October until May there is usually no direct ferry option to travel from Amorgos to Santorini. There is however the option to take a ferry from Amorgos to Naxos or Paros and then another ferry to Santorini. The overall trip duration depends on the type of vessel that you choose as well as on the wait time you will have between the two ferry rides. Travelling or island hopping in the Greek islands can be easy and fun - on ferryhopper you will find all the direct and indirect ferry connections, ferry schedules and ferry tickets so you can choose the best itineraries for your summer holidays! The ferries from Amorgos to Santorini usually depart from the port of Katapola so make sure that when you book your holidays and accommodation in Amorgos you consider the island distances. The port of Katapola is located 6 km from the Chora of Amorgos (around 15 minutes by car) and 25 km away from the port of Aegiali (around 40 minutes by car). The Amorgos - Santorini ferry route is usually operated by high speed ferries that do not carry vehicles so keep this in mind when you book your ferry tickets. The weather in the Aegean sea can often be windy during the summer so ferry rides might also get bumpy. The Amorgos - Santorini distance is a short one so you shouldn’t worry about getting seasick. If you do though, you don’t have to worry! The ferry crew could provide you with an aspirin or a seasickness tablet if you feel unwell. If you visit Santorini for more than 1 day we would definitely recommend that you book accommodation as far in advance as you can. Santorini is a very popular summer holiday destination so you should consider booking your ferry tickets as well as accommodation at least 4 months in advance. Santorini is also an ideal option for island-hopping in the Greek islands! Check our Ferry Map, discover nearby islands, find all available ferry connections from Santorini to the Cyclades islands, the Dodekanese islands or Crete and plan your holidays as soon as possible!